The Spatial Ballet is a kind of an interaction of dance with urban spaces, inspired by Oskar Schlemmer, an outstanding representative of the Bauhaus art school and his Triadic Ballet. Unusual geometric costumes for the performers were designed by Polish artist Iza Rutkowska. Her intriguing performance will be presented in Berlin. 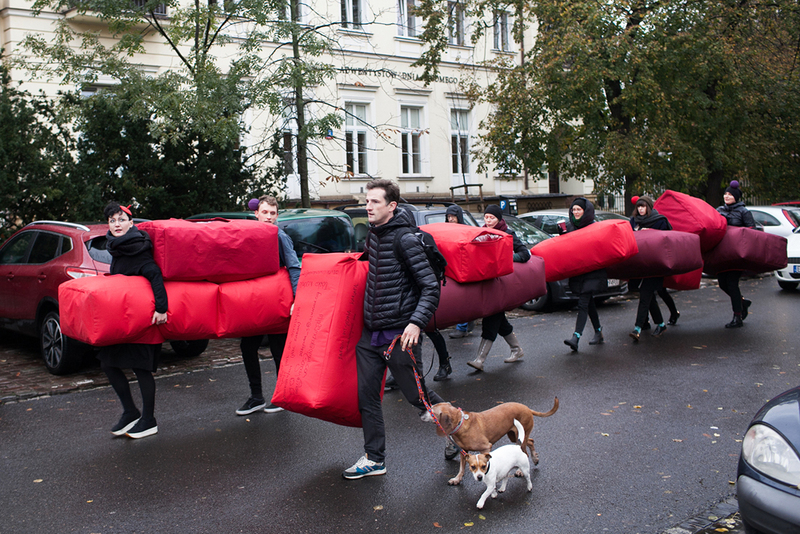 An international group of urban researchers, including dancers, architects and anthropologists will take part in Iza Rutkowska’s unique performance in Berlin. The troupe, wearing special geometric costumes will ‘dance with’ historic places, which are important from the perspective of shaping the cityscape, blurring boundaries and creating places of dialogue. The performance will be accompanied by music by young Polish musician Igor Nikiforow, which intensifies sounds of the city in a fairy tale-like manner. Passersby and spectators will be able to use these ‘human shapes’ to construct new forms – urban furniture, street architecture or any shapes or forms that they see fit. This kind of performance typical for Iza Rutkowska's work. She often uses costumes and abstract objects break people out of the constraints of the everyday and put them in unobvious and unusual settings. She creates situations in which people feel comfortable and more courageous – they reveal their needs, decide to act, open up to dialogue. She frequently takes up projects in cooperation with interdisciplinary crews of sociologists and architects. The essence of her projects are the relationships between people, which can lead to changes in the way we think, live or transform public spaces. Iza Rutkowska is an artist, cultural manager, founder of the Form and Shape Foundation and co-founder (together with Paweł Jaworski) of Szkoła Nauk Praktycznych (editor’s translation: School of Practical Sciences). She works with local governments, NGOs, cultural centres and art institutions in Poland and abroad. Her projects fall somewhere on the borderline between architecture, design and performance and focus on giving public spaces new forms and shaping them in new ways. They engage people of all ages from different environments and backgrounds.